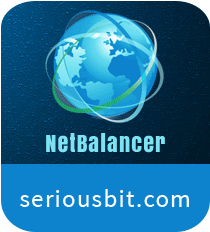 NetBalancer is a handy network monitoring application for Windows that lets you keep track of downloads and uploads activities to control the bandwidth traffic. You can use the network management tool for multiple purposes like restricting the upload and download speed of Windows applications and monitoring internet usage rates of individual programs in real time. You can even use the program as a firewall and block or limit Internet access to any process. Apart from this, several other options such as the ability to set custom rules and filters based on IP, set network protocols, and set time of the day are also present within the networking tool for Windows. You can download NetBalancer for Windows right now to monitor and manage your networks like a pro. NetBalancer boasts an interactive user interface, which makes the network monitor easily accessible for both novice and pro users. Immediately after installation, the application automatically restarts your web browsers and lists all active processes in the main frame. From here, you can check out various details like the ID, priority, Download and Upload rate, a number of connections, download and upload size, download, the creation date, upload limit, file path, and command line for each process. You can also customize other network settings from the main frame. The networking tool is simple and lightweight, which means it can run smoothly on your device without affecting system performance. Also, the app has a good response time. NetBalancer is an efficient application for monitoring your network. It is simple, lightweight, easy to use, and offers all necessary tools to keep track of incoming and outgoing traffic. What’s more exciting about the utility is that it can work efficiently without causing any performance load on your PC. In simple words, NetBalancer is a gem of a tool for your computer. You should try it at least once.